Torino is the precise reproduction of the classic road wheel for Lancia Delta Integrale, a must-have product for those nostalgic for the immortal Italian car. Manufactured in Italy, the wheel is a strong and reliable car part, being made from aluminum alloy cast under low pressure. 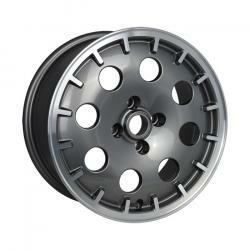 Torino is painted in anthracite with polished lip and fits the original Lancia center cap.